Do you operate in the solar industry and are looking for a venue to show off your latest products and services? Then consider being one of the trade show exhibits for Intersolar North America, where you can take advantage of a highly-targeted crowd of interested, potential buyers. The event has 25 years of experience, which means you can expect a professional infrastructure that helps exhibit your offerings. Successful trade show exhibits for Intersolar North America easily capture the attention of the attendees. Evo Exhibits’ expertise is unmatched in this area, and they can help with everything from exhibit design to logistics and storing your exhibit between shows. The exhibition series started in 2008 and has become the number one networking platform in North America for the solar industry. Today, events are held across 4 continents and the attendee numbers have reached record numbers. In 2017, Intersolar North America attracted in excess of 15,000 attendees and 533 exhibitors! The event is not only a venue to sell products but a chance to network with the top minds in the industry. The opportunities for forging strategic alliances and becoming an integral part of the industry are too good to pass up. Intersolar North America caters to a number of businesses, including service providers, distributors, suppliers and manufacturers. Come and see what all the excitement is about for yourself at the largest solar event in North America. It’s estimated that over 16,000 attendees will be coming – a combination of enthusiasts and industry professionals that are looking to invest in companies like yours. Impress the right people and there is no limit to the size of orders you can secure. The visitor profiles are described by the organizers: installers and integrators, distributors, project developers, EPC contractors, architects, manufacturers & suppliers, investors & analysts, utilities, government officials, and policy makers. The wide array of attendees means you need to have a pitch ready for each type of individual for maximum success. Attendees will expect to see industry leading technologies at the event, so bring your best stuff to show off at your trade show exhibit for Intersolar North America. 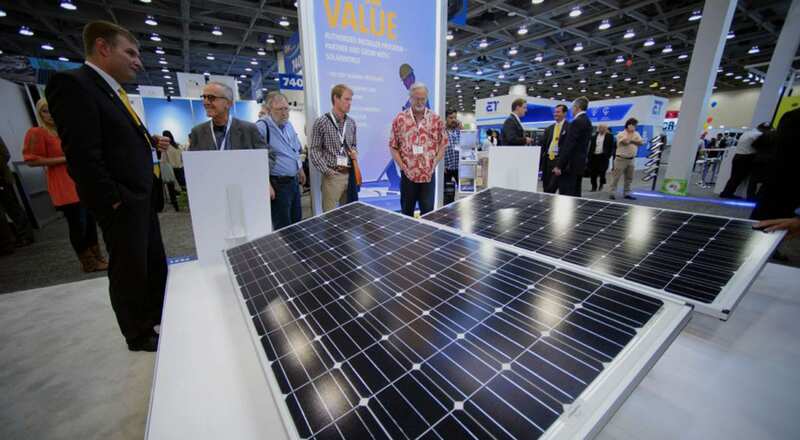 You should be one of the trade show exhibits for Intersolar North America if you operate in the solar industry or provide products that compliment this space. It’s crucial to have the infrastructure to acquire new customers that want deliveries executed fast. Play your cards right and you may secure lots of orders at the event. Businesses should also attend that want to raise brand awareness and network with other companies in the solar industry. The high density of solar industry professionals means participating brands can get a high amount of exposure by the media at the event. It doesn’t matter if you are in your first few years as a company or have over 25 years of experience in the industry. The event will be beneficial for all as there is so much opportunity and a wide array of attendees. Product visibility: Your products should be highly visible so that attendees can see them in action. Set up a demonstration of how they work so the audience has a better idea of what they will be buying. Allowing customers to get hands-on with the product increases the chance of a sale. Interactivity can be achieved via a number of different technologies, and virtual reality is a great example. Giving customers a VR experience where they can see products in action is not only practical, but impressive. Branding: Intersolar North America is a great place for brand exposure. This is especially true if you are a newcomer to the industry. Your trade show exhibit should have your brand name and logo clearly located for everyone to see. It’s also a good idea for employees to wear branded clothing and pass out brochures. Concise information: The huge number of exhibitors means attendees can get easily over-saturated with information that will be thrown their way. Make sure to provide all the key points about your products in a direct and concise manner. Potential buyers are more likely to remember you if they were able to effectively understand what your product was about as they walked by the trade show booth. Setting up a professional looking trade show booth can be overwhelming if you have no prior experience. Evo Exhibits will make light work of ensuring you have one of the best trade show booths at Intersolar North America. They have helped businesses across a wide array of industries to attract crowds to their exhibits. A number of workshops will be available to explore areas of your industry in greater detail. You can learn about the current trends in the industry and what technologies are providing breakthroughs. This will help your business figure out a course of action to stay competitive in the coming years. Being one of the trade show exhibits for Intersolar North America gives you a number of key opportunities to expand the profile of your business. Network with potential strategic business partners, raise brand awareness, and attract a group of new, loyal customers. For any business in the solar industry, attending this event is invaluable. To get the most out of the experience, your trade show booth must be appealing – otherwise you’ll be fighting an uphill battle. Evo Exhibits can assist with a number of tasks, such as designing your booth, logistics, and the installation and dismantling of your exhibit.